For details about Harrison’s Special Purpose Local Option Sales Tax (SPLOST) project, please visit the Cobb County School District website. A SPLOST is an optional one percent county sales tax that is approved by voters in Cobb County. The Cobb County School District SPLOST department is responsible for all aspects of planning, implementation, and completion of all SPLOST projects and activities. 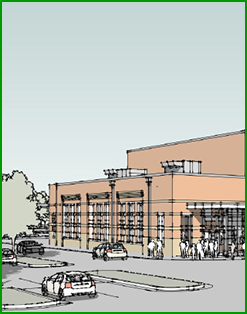 Harrison’s SPLOST project includes a new gym and performing arts center. Construction began at the end of May 2018 with a scheduled completion date of June 2019. Harrison’s SPLOST project will also include the replacement of exterior doors, hardware, and in some instances the surrounding windows/frames attached to the doors. Other details for Harrison’s SPLOST project are located below. We will update the Harrison community on this project with occasional messages in the weekly e-blast to parents. Thank you for your patience during the Cobb County School District’s SPLOST construction. We are looking forward to the improvements to our campus for our students, staff, and community at large. The original projected date for substantial completion of both the new gym and new performing arts center was late-May to early-June 2019. Currently, the performing arts center is very close to being on schedule, but the gym is a little behind due to the heavy amounts of rain we received over the last several months. With roof work nearly being complete on both of the new buildings, delays caused by weather will be much less of a factor toward completion of the project. At this point, we are looking at both new facilities to be available for use by late-June to early-July 2019. We will open the bus port back up at the completion of the project, at which point we will no longer need the temporary bus port area in front of the school. This will open up the front of the school for normal pick-up/drop-off traffic patterns, and also free up some additional parking that the temporary bus port area currently takes up. Other parking areas around the school that are currently inside restricted construction zones will also be available once the project is complete, including a large parking area behind the school where the tennis courts were previously located. Upon project completion, we project that we will have more overall parking on our campus than we originally had before construction started.